How many of us have heard, When you find the right man or woman, you'll just know! What does that really mean? What if you only think you know or want to feel like you know? Can you want the feeling to be there so badly that you artificially create the feeling of knowing? And wha... read full description below. How many of us have heard, When you find the right man or woman, you'll just know! What does that really mean? What if you only think you know or want to feel like you know? Can you want the feeling to be there so badly that you artificially create the feeling of knowing? And what if you make this very important decision based upon a false knowing or an illusion of a feeling? There are too many important factors and variables to consider and, without structure, the thoughts of marriage and compatibility become confusing and sometimes overwhelming. 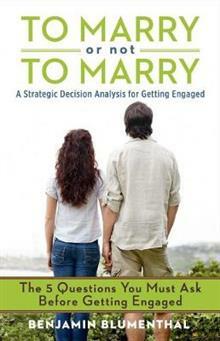 The author explains a comprehensive method to address and measure the elements vital to the decision of getting engaged. After years of analysis, it has been condensed into Five Questions that dramatically increase the likelihood of a happy and successful marriage. Each is a question that you must ask yourself about your mate and the answer must be Yes to all five questions. This takes a lot of courage to look at the hidden truths, so good luck! Benjamin Blumenthal is certified in Pre-Cognitive Re-Education, a practice related to behavioral psychology that examines the sources of negative behaviors and provides the tools with which the behavior can be influenced and modified on the subconscious level. Mr. Blumenthal has been certified to practice the work since 1998. He is also a certified mediator in the State of Georgia, having been accredited in civil alternative dispute resolution. Mr. Blumenthal received advanced additional training in cross cultural dispute resolution. He studied at Oxford University in England, has a BA from Emory University and an MBA from Emory's Goizueta Business School.